The future of highly-rated Argentine goalkeeper Gerónimo Rulli has finally been decided, according to Mundo Deportivo and other Spanish newspapers. Despite strong interest from Manchester City, he has told Pep Guardiola that he wants to stay at Real Sociedad, where he has been on loan via the third-party investment fund that owns his sporting rights. 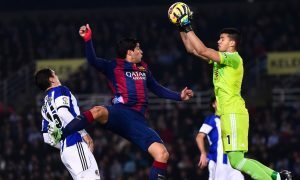 Real Sociedad will sign him permanently for €7 million (£5.5 million) in the coming days after coming to an agreement with the investment fund, one in which City have a stake, and which has entitled them to a first option on Rulli. However, the talented shot-stopper could still end up at City one day. His reason for refusing a move to the Etihad, as well as other interested suitors, is the security he feels at La Real. He is guaranteed to start every week, and the same couldn’t be said if he was up against England’s number one Joe Hart. City are aware of Rulli’s potential and will have an option to buy him in future for just €14 million (£11 million), a clause in the deal. Some day that could turn out to be a bargain for one of La Liga’s better young goalkeepers. For now, Rulli will sign a six-year contract with Real Sociedad and continue there. Pep Guardiola’s hunt for a new goalkeeper to rival Joe Hart goes on. Marc-André ter Stegen has reportedly opted to remain at Barcelona, but many other goalkeepers have been linked, including Benfica’s Ederson Moraes who recently said he prefers City to Bayern Munich.